PARIS, FRANCE – President Donald Trump walked apart from the dozens of world leaders who marched together Sunday toward the Arc de Triomphe to commemorate the moment when World War I ended 100 years ago, a time when Western allies believed the world’s survival depended on American leadership and global cooperation. Then Trump watched uncomfortably as French President Emmanuel Macron warned that nationalism, a label Trump recently embraced for his “America First” movement, threatened to undermine global order and inflict more suffering on the world. Macron’s address was another dramatic recognition of the widespread anger and concern in Europe and elsewhere about Trump’s belligerent rhetoric and policies, which have isolated the United States in some areas and challenged the institutions that took shape after the two world wars to ensure peace. 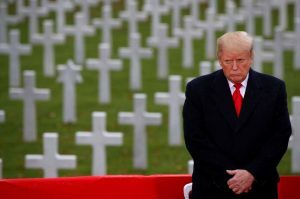 The White House said Trump didn’t join other leaders in marching under dark umbrellas to the Armistice Day centennial commemoration, arriving by motorcade instead, because of security concerns. But it also symbolized how Trump views himself as apart from other world leaders and his predecessors in the White House, who transformed America into the world’s only superpower. As the U.S. president, Trump was given a front-row-center seat Sunday among the other leaders, receiving a hearty handshake from Macron and a thumbs up from Russian President Vladimir Putin after Trump took his place under a temporary viewing structure that protected them from rain. But the keynote speech delivered by Macron was not designed to comfort Trump. He cast nationalism as a dangerous and selfish ideology that pushed countries into that war and now risked undermining its lessons. Ignoring those lessons, he said, led to World War II and even more suffering. Merkel has also stood in opposition to Trump’s worldview, promising common cause and unity with Macron during a ceremony Saturday intended to show reconciliation between the former adversaries. “The lesson we draw of the Great War cannot be rancor and resentment against other nations and it cannot be allowing the past to be forgotten,” Macron said Sunday. Macon did not name Trump. But his aim was clear. “Let us add our hopes together instead of seeing our fears oppose each other,” he said. Macron’s speech was the centerpiece of a memorial service that commemorated one of the bloodiest wars in history, which ended on the 11th hour of the 11th day of the 11th month but left a long legacy of suffering. Cellist Yo Yo Ma joined the French violinist Renaud Capucon for a Ravel sonata. High school students read testimonials from allied soldiers recounting tears and exhilaration from the war’s end. Beninese singer Angelique Kidjo sang a song of devotion and gratitude. Trump also attended a lunch with world leaders, including Putin, on Sunday. The event was closed to the press. U.S. officials said beforehand that they did not expect more than a greeting between the Russian and American presidents.